7.30pm, Thursday, 26th May. An illustrated talk and book signing by Helen Couchman about her grandmother and her hats. Mrs. West’s Hats and an essay about the work are published in a hardback book by the same name. Talk tickets, £5 obtainable at the gallery. 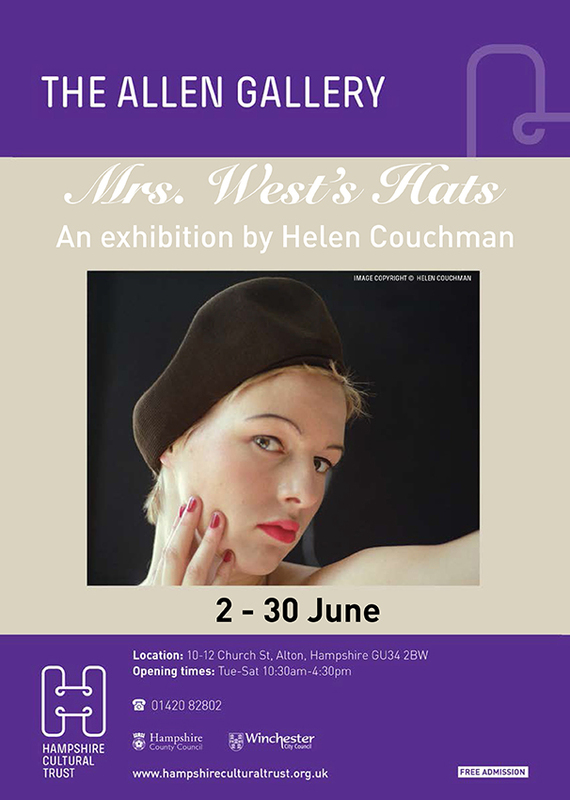 Mrs West’s Hats the exhibition runs between Thursday 2 – 30 June. Open Tuesday – Saturday from 10.30am – 4.30pm. Entry is free. Mrs West of Binsted was a resourceful lady. She was expected to accompany her husband to many important social events, including garden parties at Buckingham Palace. But cloth was rationed, so instead of a new outfit she wore a different hat for each occasion. Some she bought and others she made herself so that each time it looked as though she was wearing a new outfit. After Mrs West’s death, her granddaughter Helen Couchman, who had by now qualified with a BA in Fine Art and an MA in Critical Fine Art Practice, collected together the hats – there were over 60 of them – and photographed herself in the style of the time wearing them and also her grandmother’s original make-up. She then turned the resulting photographs into an artwork which she named ‘Mrs West’s Hats’. And now ‘Mrs West’s Hats’ is to be exhibited in Alton’s Allen Gallery in June. The exhibition is preceded on May 26th by an illustrated talk by Helen Couchman herself about her grandmother, her hats and what they reveal about life and fashion in the 1930s, 40s and 50s. The exhibition ‘Mrs West’s Hats’ runs at the Allen Gallery, 10-12 Church Street, Alton between Thursday 2nd and Thursday 30th June. The gallery is open Tuesday – Saturday from 10.30 a.m. to 4.30 p.m. and entry is free. 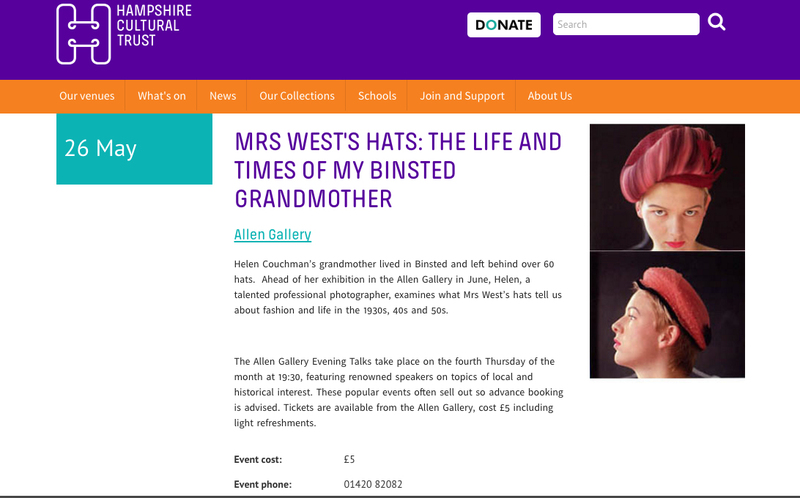 The talk ‘Mrs West’s Hats, the life and times of my Binsted grandmother’ takes place at the Allen Gallery at 7.30 p.m. on Thursday 26th May. Tickets, obtainable at the gallery or on 01420 82802, cost £5 to include light refreshments. Both events also feature on the website of Hampshire Cultural Trust, www.hampshireculturaltrust.org.uk, while further information about Helen Couchman’s work can be found on www.helencouchman.com. ‘Mrs. West’s Hats’ and an essay about the work are published in a hardback book costing £12, ISBN 9780956017208, available in the Allen Gallery shop and online at www.SoloshowPublishing.com.